Los Angeles Mayor Eric Garcetti took advantage of his Hollywood ties in a move that could bolster his rumored but yet-unannounced campaign for the 2020 Democratic presidential nomination. Garcetti hosted a fundraiser for the South Carolina Democratic Party Tuesday at the Los Angeles home of Showtime CEO David Nevins that netted the organization over $100,000, according to Politico. The sum is nearly equal to what the party raised throughout the entire month of March. The fundraiser was attended by prominent Hollywood liberals like Nicole Richie and her husband, Good Charlotte vocalist Joel Madden, amongst others. Garcetti said he was pleased to fundraise for the party, especially since California dollars would go a lot further in South Carolina's media market. The mayor asserted that South Carolina Democrats, if provided with appropriate resources, would be in a much better position to start winning elections. "[South Carolina is] a state that with a little bit of effort from all of us wouldn’t just be about winning one campaign, but could be about flipping a state that right now we ignore," Garcetti said. Jaime Harrison, a former chairman of the South Carolina Democratic Party who currently serves on the Democratic National Committee, echoed the mayor's sentiment. Harrison joked that in California, $1 million wouldn't be enough to run one race for the state legislature, but in South Carolina, it could underwrite 10 to 15 races. "Now $1 million here, you guys don’t even turn your heads, right?" Harrison joked. 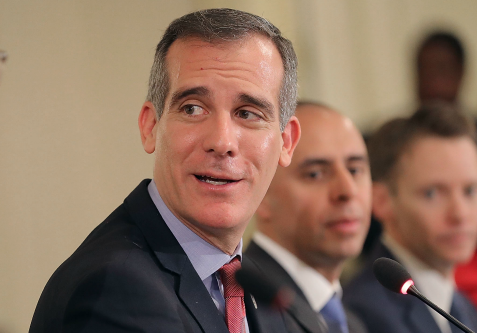 In December, Garcetti admitted he was seriously considering a bid for the White House in 2020. Since that time, the mayor has ramped up his criticism of President Donald Trump, increased his travel, and taken a more active role in fundraising for Democrats up and down the ballot. The fundraiser occurred two days after Garcetti returned from New Hampshire, where on Sunday he delivered the commencement address to the graduating class of Southern New Hampshire University. The trip was Garcetti's second to the Granite State; he journeyed to Manchester last August to campaign for a local mayoral candidate. The state is the first state to hold its presidential primary after the Iowa Caucuses, and it has been pivotal to helping presidential candidates with little national following establish credibility. In April, Garcetti made a high-profile trip to Iowa to rally Democratic activists. The mayor's two-day swing through the state included appearances in all the major media markets as well as meetings with leaders from organized labor, a prime constituency of the Democratic Party's base. Since the last election, Garcetti has visited all four of the first nominating states of Iowa, New Hampshire, Nevada and South Carolina. While the Los Angeles major appears to be leading the way among Democratic hopefuls in visiting the traditionally must-stop states, Politico reported last fall that some 2020 hopefuls were giving preference to under-the-radar visits in battleground states like Florida, Ohio and Michigan. Garcetti advisor Yusef Robb told mynewsLA.com that Garcetti's decision to host the fundraiser came from the understanding that the Democratic Party could no longer afford to ignore local elections. "If we ignore races outside of Washington, we allow the GOP to gerrymander and solidify their position in a state and in Congress," Robb said. "We allow them to drive turnout. We allow them to enact their agenda into law, and whether you are affected by a state law or federal law, for the individual affected, it’s the same." This entry was posted in Politics and tagged 2020 Election, California, Democratic Party, Eric Garcetti, Fundraiser, Hollywood, South Carolina. Bookmark the permalink.